Today's post is more likely to be useful for parents having children of 1+ yrs of age. These little kids catch cold so easily and frequently that most of the times parents feel helpless what caused them this health problem. Because it is quite common that the cough n cold lead to fever and result in multiple visits to doctor's clinic. And the more annoying situation which I usually face with my child is to convince him to take medicine (if its a tablet) that he finds really difficult to swallow due to resultant sore throat and spits it out. 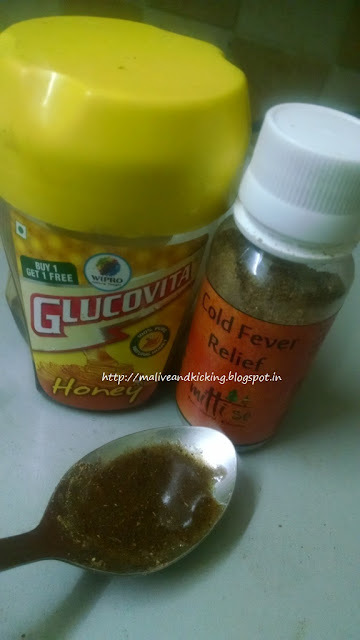 To avoid this, most of the times I follow some home remedies by mixing some herbs, spice etc to cure cough, mild fever. I know there are many such ayurvedic preparations available in market which claim to be natural, and assure of immediate relief. 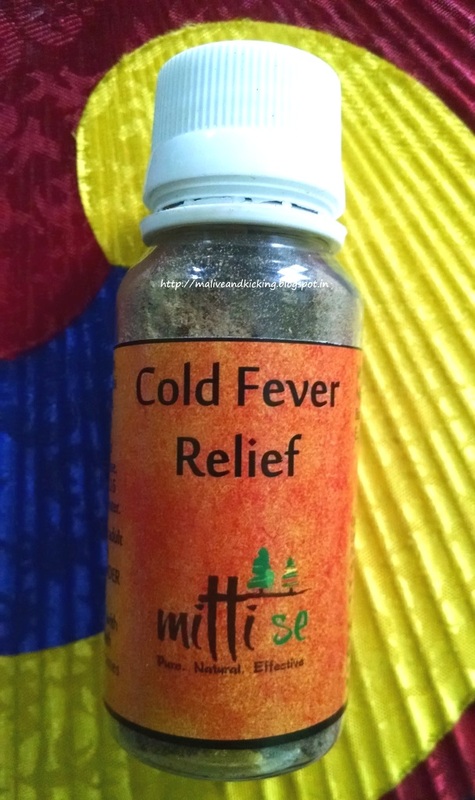 In the quest of finding a beneficial remedy, I found Cold Fever Relief from 'Mitti Se' which I have been taking to cure my cold right now and found it quite effective. So thought of writing about it.. Product Claims: Cures cold, cough and fever, removes congestion. Removes accumulated phlegm and toxins from lungs and body. Very effective in building immunity. Peepli, Tulsi, Black Pepper, Mace, Nutmeg, Green Cardamom, Black Cardamom, Cloves, Cinnamon, Ginger. For an adult, 1 tsp of the powder mixed with 2 tsp of pure honey is advised. This quantity makes 4-5 doses that should be eaten/licked spread over a day. Don't drink water afterwards. The complete relief can be expected with 2-5 days depending on how severe the problem is. 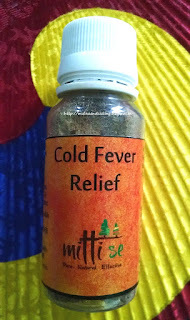 The Cold Fever Relief powder is considered safe for children above 1 year. But the dosage mentioned above should be reduced to half the Adult dosage for a child upto the age of 12 yrs. The product is packed in handy plastic bottle that is transparent. The fine details are all given on its label as the brand ensures transparency in sharing the constituents of all products. And I admire it completely. The moment I unscrewed the top cap, I could sniff a strong mixed aroma of cardamom and cinnamon. The powder is deep brown and finely milled. I may notice minute fiber in it that we usually get our of grinding dry spices. 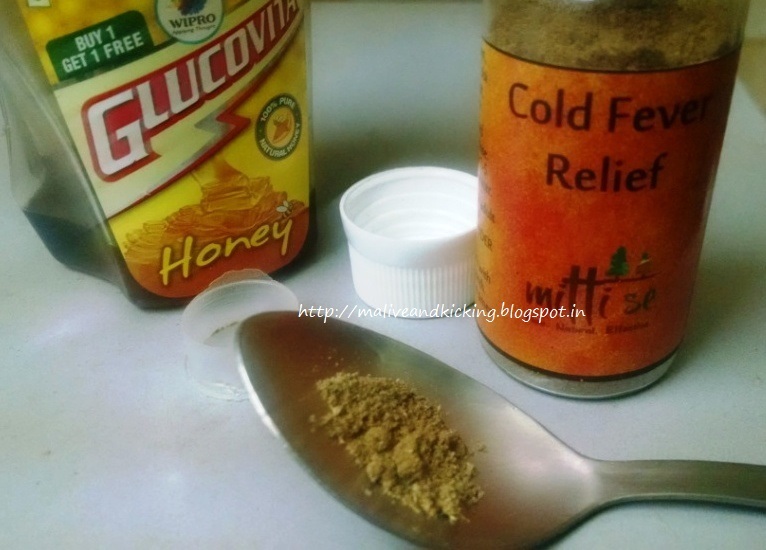 The powder mixed with honey gives a flavour identical to Chyawanprash that I totally loved. No yucky aftertaste will let you reject this remedy. After 4 to 5 dosages per day taken for 2 consecutive days, the scratchy sore throat felt nearly normal. 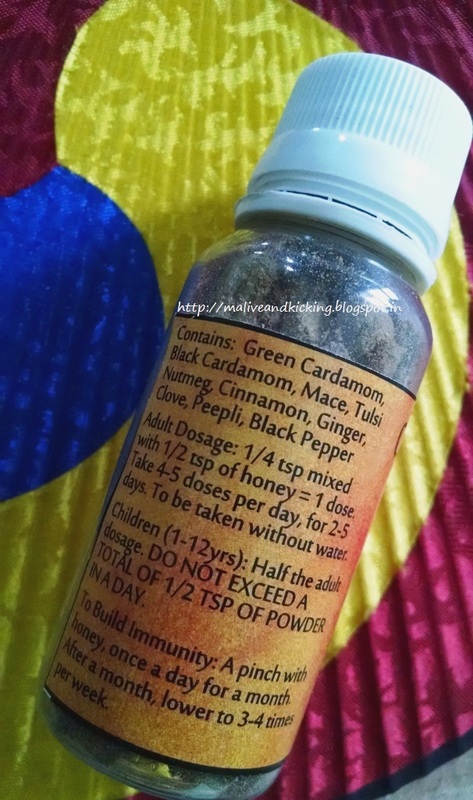 Because clove, pepper and cardamom are said to cure throat related disorders very easily. And the appetite is also revived which I expect has happened due to cardamom powder again. The only concern now that is the watery nose that won't take much time to fled away. Due to the weather change, other family members have also started little dosage of this powder as it not only cures the cold n fever, but also builds immunity. Enriched with beneficial herbs and spices. Prevents and cures cough n cold quite effectively. Little Quantity used per dosage. Labels: Cold Fever Relief, health, Mitti Se, Natural remedy, review, Review. Its a must try remedy that will not cause any side effects. Its too good and you may completely avoid medicine if u use this.